Staring out into the dry abyss of whisking sand dunes, scarf flowing in the arid breeze, Journey feels immediately familiar. The ominous mountain rests invitingly in the distance, drawing me nearer as I start taking the first few footsteps of my second playthrough in over three years. As the mysterious robed figure effortlessly glides into the air, slides down dipping dunes or simply puts one foot in front of the other, Journey starts taking grasp of your emotional strings. Strings that it has no intention of ever letting go again. Late in 2010, my grandfather passed away after an overly long battle with lung cancer. It’s the type of family disaster you expect but can never really prepare for – the emptiness of a loving figure, everything suddenly empty and quiet. Over time that void fills, life carries on and for the most part you think you’ve overcome the sadness. It was, however, only two years later that I realised what it meant to come to terms with death – not only understanding the role it plays in losing the ones you love, but also facing the prospect of it coldly reaching for you too eventually. 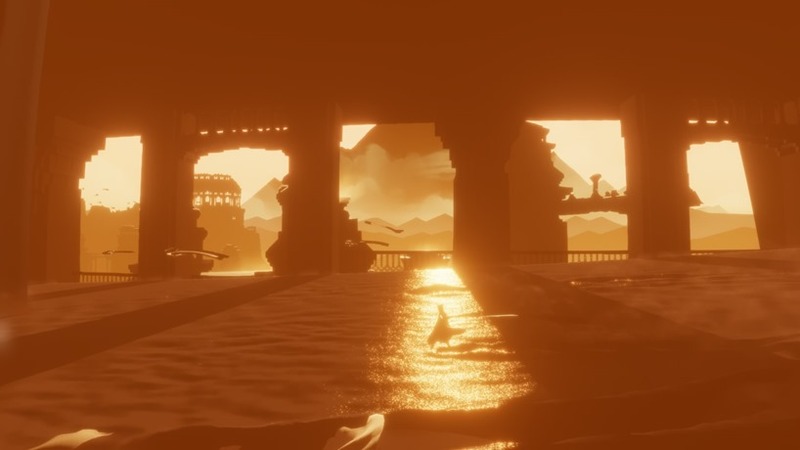 Journey is about many things, but its themes surrounding ideas of life and death shine through prominently. Playing it on PS3 three years ago, I experienced it mostly alone. Never wandering upon lost online strangers helped the game connect with me on a very personal level – reminding me of a tragedy that had occurred years before. Through its three or so hour experience, I finally came to terms with the loss – with the plight of the mysterious figure and his journey to the distant mountain encapsulating so much about what it means to live, and eventually die. Going into the game for a second time (something which I was hesitant about in the first place), I expected much of the same. Hiking up the first few mountains, I was introduced to Journey’s now famous vistas; views filled to the brim with splendour, Journey gently kisses the horizon with playful strokes of water colour. Soft hues and striking sunsets feel warm, enveloping you in their golden embrace while racing down glistening seas of sand. 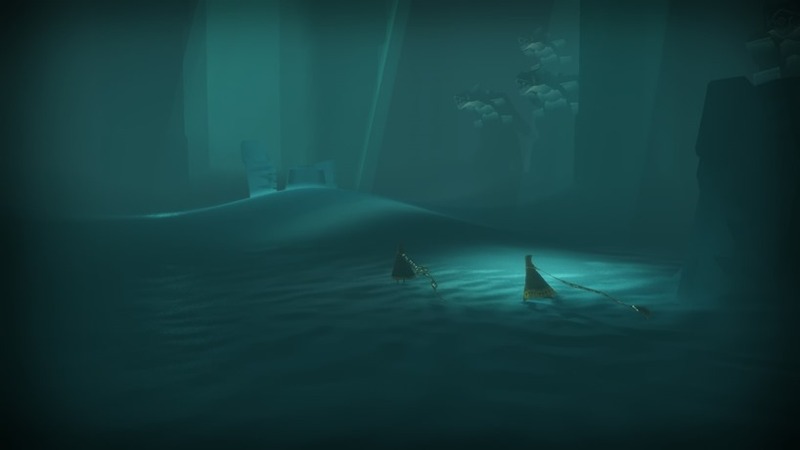 The dark, sea blue caverns later in the game feel cold and dangerous, masterfully matching the mood the game manages to engross you in from start to finish. Journey benefits from the PS4 in terms of raw power – delivering higher resolution textures and a smoother frame rate – but they’re largely differences that you’ll barely notice. The beauty of Journey comes through its unmistakable art direction – a testament to beauty not being confined by age. It’s a game that looked incredible in 2012, looks even more so now and will probably continue doing so until the end of time. Reaching the first peak of many, I spotted a figure in the distance. 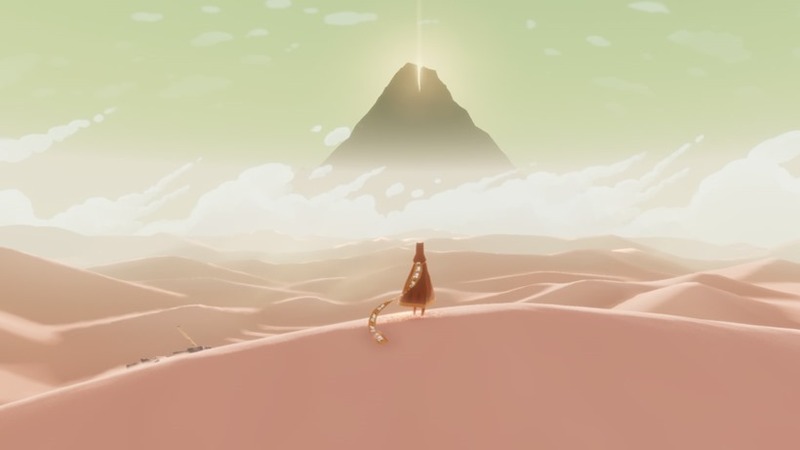 Journey is filled with floating fabric and the enigmatic creatures created with them, but it is somewhat rare to find a mirror image of yourself wandering the desert. There’s no way to directly communicate with other players, barring a single button that emits anything from a soft, almost inaudible ping to a large, encompassing yell. Linking up with a player opened up Journey in a way I didn’t expect – turning the once sombre experience into another of companionship and camaraderie. Burning through Journey’s scarf – its own metaphor for life – and soaring into the sky with a single button, partner in tow, was one of the most euphoric moments I’ve ever experienced in a game. Journey drives these moments home, filling early care-free areas with enough opportunity to grow, spend and mess around with the game’s addictive flight. Moments that turn from splendour to heartbreak in a matter of minutes, as hulking stone enemies swoop from the sky to steal whatever power you have. There’s no way to fight back, leaving my travelling partner and I to seek refuge and hide as best we can. Every moment of joy or despair was only exponentially multiplied with my companion by my side. Seeing the large obelisks dive bomb his comparatively miniature figure was heart-breaking – the flowing pieces of his broken scarf driving home the awful truth that his inherent joy was now diminished. Breaking through into safety, I turned to commemoratively ping my companion now that the worst was behind us, only to find an empty sea of sand greeting me. My friend without a name had disappeared, and my heart immediately sank. Like losing a friend to the trials and tribulations of day-to-day life, I was left to see out the rest of Journey alone – without the warm embrace of a fellow robe to make the good times better, and the hard times less taxing. 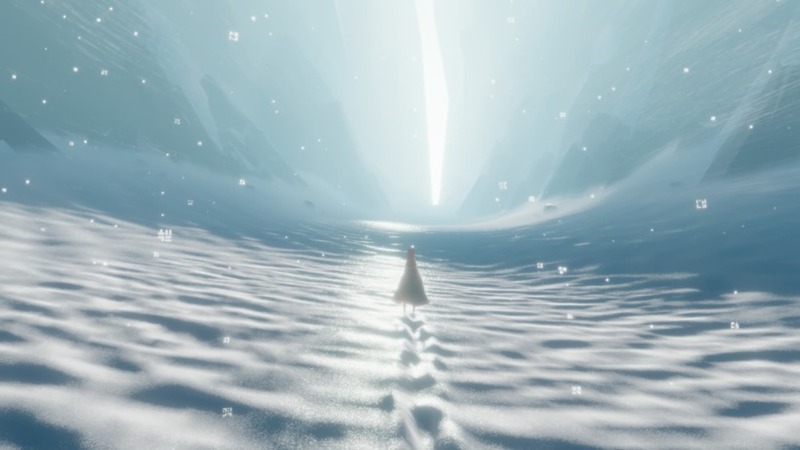 It was at this moment that the true beauty of Journey really dawned on me. On the surface, the game scratches at various themes, but it is ultimately you as the player that chooses which to explore simply through playing. While my first experience dealt with a solitary journey while pondering on the meanings of life and death, the second emphasised the bond people create with each other, and how we’re forced to deal with it when it’s inexplicably severed. Journey is tightly structured experience, but it’s one that allows you to freely fill it with emotion of your own. A piece of art that doubles as a blank canvas. It’s powerful too, with its palpable yet exhilarating conclusion leaving you with memories that you’ll find difficult to ever forget. 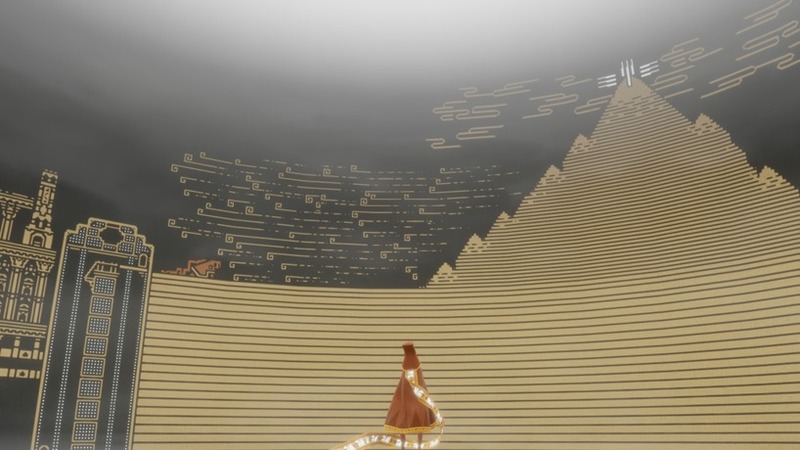 I’ve often compared the thatgamecompany’s crowning achievement to the likes of The Great Gig in the Sky. Just like Pink Floyd’s lyricless masterpiece, Journey is a crescendo of emotion masterfully stirred to illicit the deepest emotions in players. And even if it isn’t able to communicate with you on such a deep, personal level, it’s impossible to deny the emphatic highs that Journey so effortlessly hits. An essential game in 2012, and even more so now. 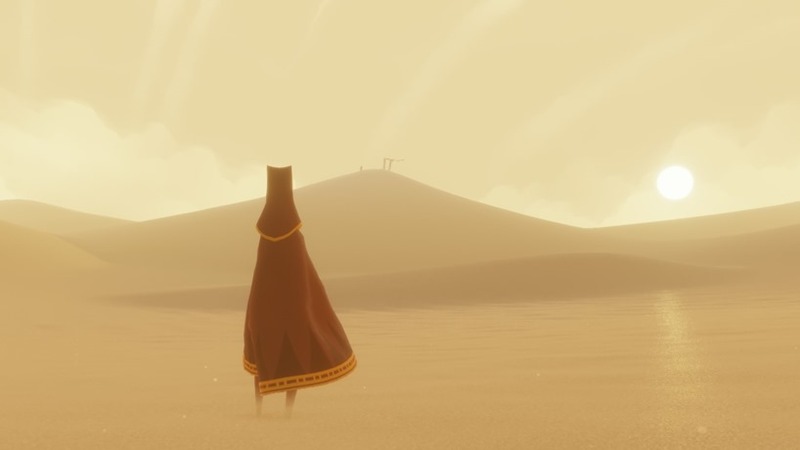 Pulling on emotional strings throughout, Journey is every bit the masterpiece on PS4 that it was on PS3. It’s an emphatic example of art, sound and design working in complete harmony together, creating a piece of digital art that just begs to be experienced. 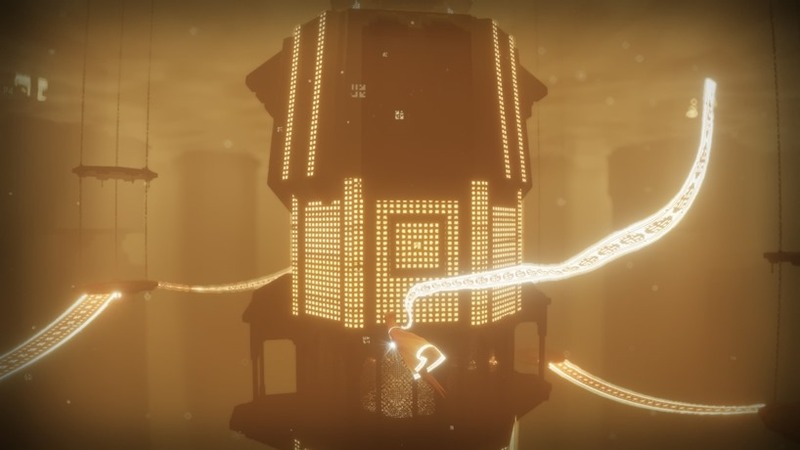 Journey is nearly flawless, and will remain so until the end of time.